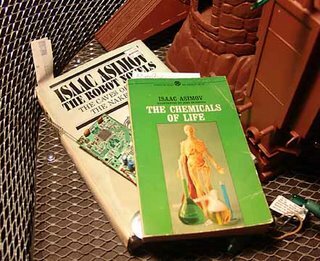 Latest exploration of the hidden Biom underground village revealed a circuit board amongst a pile of books authored by Isaac Asimov. We fear that the Bioms are working on a Positronic brain. Worse yet, possible a Gravitronic brain! More soon. P.C. Recently one of the Lab"s ground keepers discovered the entrance to a Biom underground village. A small sign with a barcode on it and a cable extending from the hole revealed the entrance. This now answers the question of where the Bioms went after the destruction of their above ground village. 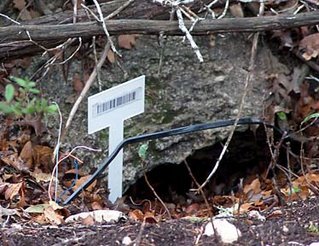 We have successfully penetrated on underground Biom village with a digital camera integrated within a Biomechanical. This time we went digital instead of VHS. The detail is incredible and a bit frightening. 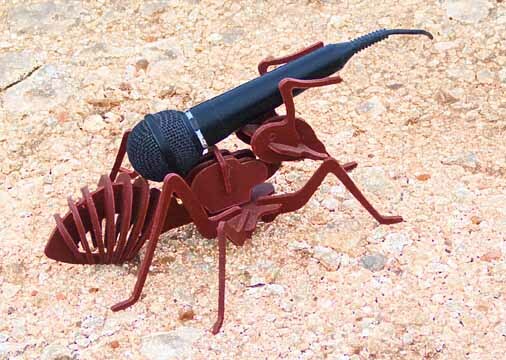 The Lab has successfully field tested it's new stealth listening device on a Biom village. Unfortunately what we heard was nothing but incomprehensible gibberish. The sounds may just be that of plastic gears grinding on each other and shorting out electrical circuits. Our field test of a stealth camera failed when the Bioms discovered it and pillaged parts. Next time we shall go digital to reduce the size.